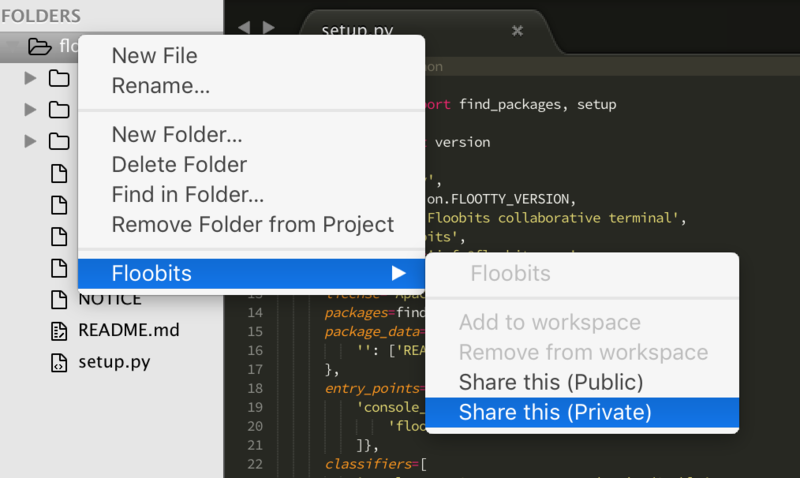 To get the most out of Floobits, you’ll want to install an editor plugin. Right now we have plugins for Sublime Text, Emacs, and Neovim. See the plugin help page for more information. Once you have a plugin installed, you can create a workspace using the Share Directory command. The web editor also lets you import Git, Mercurial, and Subversion repositories. Just go to File → Add files and enter the repository type and URL. If your repository is private, you’ll need to give access to this public SSH key. If your repository is on GitHub, you can simply add Floobot as a collaborator. See our GitHub instructions for Floobits for more information. Voice chat is crucial for collaborating remotely. That’s why Floobits has WebRTC and Google Hangout integration.